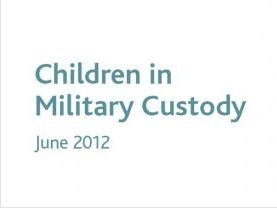 The Working Group made recommendations relating to the treatment of children in military detention. 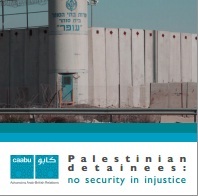 There were specific recommendations relating to the inequality of treatment under Israel’s military and civilian legal systems; night arrests; the use of restraints; solitary confinement; denial of legal representation; confessions in Hebrew; and the audio-visual recording of all interrogations involving children. This Bulletin is UNICEF's first update since the publication of the 2013 report - Children in Israeli Military Detention - which concluded that ill-treatment appeared to be "widespread, systematic and institutionalised." Based on recent evidence collected by UNICEF it appears that ill-treatment still appears to be widespread, systematic and institutionalised 7 months on. This submission highlights the discriminatory application of law in the West Bank. The legal foundation for the report is based on the principle that no state is permitted to discriminate between those over whom it exercises penal jurisdiction based on race or national identity. In spite of this principle, Palestinians living in the West Bank are subject to Israeli military law, whereas civilian law is applied to Israeli settlers. This report considers 56 testimonies from minors who reported abuse during interrogation at the Etzion interrogation centre. The violence included slaps, punches and kicks to all parts of the body, and blows with objects, such as a gun or a stick. Some of the former interrogatees also reported threats: in twelve cases, they claimed that the interrogator had threatened them or female relatives with sexual assault. In its Concluding Observations of Israel's periodic reports under the Convention on the Rights of the Child, the Committee recognised Israel's security concerns but expressed deep concern at the treatment of children held in military detention. The Committee expressed concern that children continue to be arrested in the middle of the night; and are often subjected to torture and/or ill-treatment leading to coerced confessions. The report highlights global trends regarding the impact of armed conflict on children in 21 locations, including Israel and Palestine. In all 115 cases documented by the UN the children held in Israeli military custody reported being subjected to “cruel and degrading ill-treatment”. The UN also noted that 21 boys (18 per cent) were held in solitary confinement ranging from 1-20 days inside Israel. This report covers human rights abuses in 2012. The report notes that children accused of throwing stones continue to report abuse, which in some cases may amount to torture, at the hands of the Israeli authorities. The treatment includes beatings, long-term handcuffing, threats, intimidation and solitary confinement with the purpose of coercing a confession. 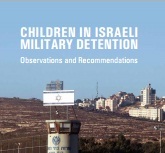 This report reviews over 400 cases and concludes that ill-treatment of children in the Israeli military detention system “appears to be widespread, systematic and institutionalized”. UNICEF found a pattern of ill-treatment involving night time arrests; excessive use of blindfolds and painful hand ties; and physical and verbal abuse. UNICEF also found that most children are transferred to prisons inside Israel in violation of the Fourth Geneva Convention. This report notes that approximately 500-700 Palestinian children are prosecuted in Israeli military courts every year. The report observes that whereas Palestinian children in the West Bank are subject to martial law, settler children are subject to civilian law, with far greater rights and protections. The report traces the ill-treatment of children from the time of arrest to their eventual prosecution in the military courts. The report was produced by a delegation of prominent UK lawyers and is based on principles of the rule of law and children’s rights. Based solely on legal differentials between Israeli military law and its international legal obligations, the report finds that Israel is in breach of its obligations under the Convention on the Rights of the Child and the Fourth Geneva Convention. The report makes 40 recommendations.